Don’t judge a book by its cover, my old gran used to say (and some of the covers of the books she read certainly proved she believed what she said), but in practice it is difficult advice to follow. Covers have a huge impact on our approach to a book – and combined with an old-fashioned feeling title this one screamed ‘dull textbooky kind of thing at me.’ Luckily, though, I resisted the urge to lose it at the bottom of the review pile, because Radiationhas a lot going for it. Marjorie Malley divides her book into three main sections. The first, biggest, and best gives us the history of the discovery of radioactivity and the development of the theory of what was going on. 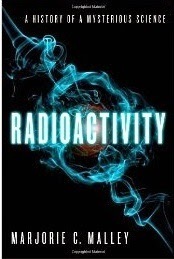 The second, which is quite interesting, looks at the applications of radioactivity. And the third, which isn’t very interesting at all, seems to be a sort of ‘put radioactivity into context’ that did very little for me. But that doesn’t matter, because that first section is so good. It’s not that the material itself was all that new to me. I had read plenty, for example, about the Curies and their work, or about Rutherford. But what I found absolutely fascinating – and it’s something I’ve hardly ever come across in popular science writing – is the way that Malley makes us time travellers, g the feel for exactly what people were thinking and saying as work on radioactivity progressed. Instead of getting a sanitised story with a logical building of ideas, we travelled down all sorts of dead ends and incorrect theories. At times it could be quite confusing, not knowing which bits would later be proved correct, but it gave a much better feel for the nature of such scientific discovery than a typical book on the subject. As a science writer myself I’m in awe of the work that must have gone into getting that changing perspective as we move through the timeline. It’s magnificent. So even though the middle section on applications is rushed and the final section did nothing for me, I’d still highly recommend this slim book for a great insight into an important period and series of events in the history of science.